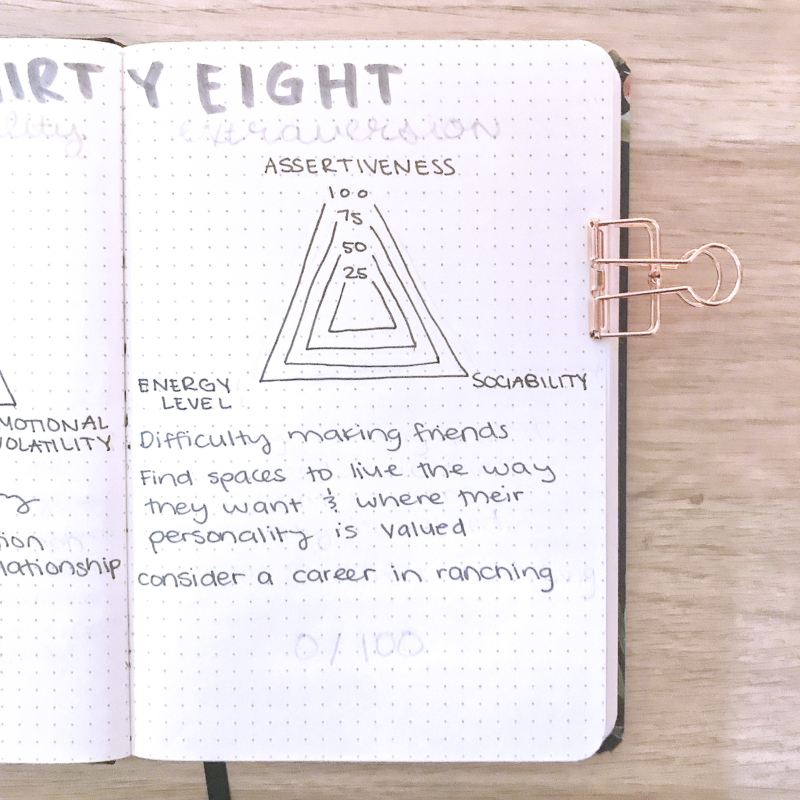 In today’s post, I want to share with you a new personality test I recently found & how I’m integrating it into my planner. 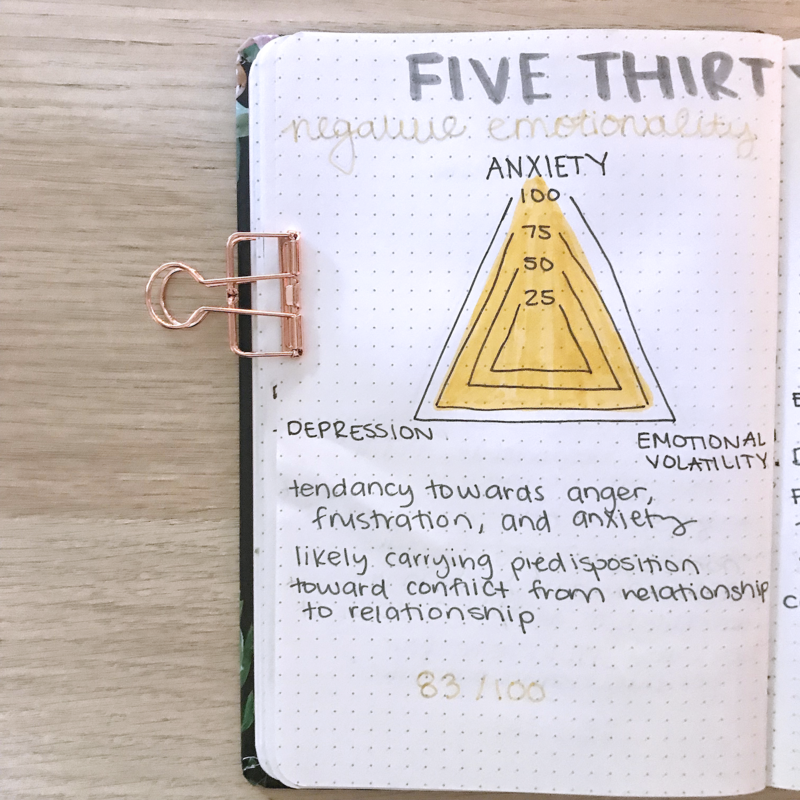 Keep reading to see how I integrate the FiveThirtyEight test in my bullet journal! I was scrolling through twitter last week and I stumbled upon a new personality test. I’m a sucker for taking these tests, particularly when they’re science backed. 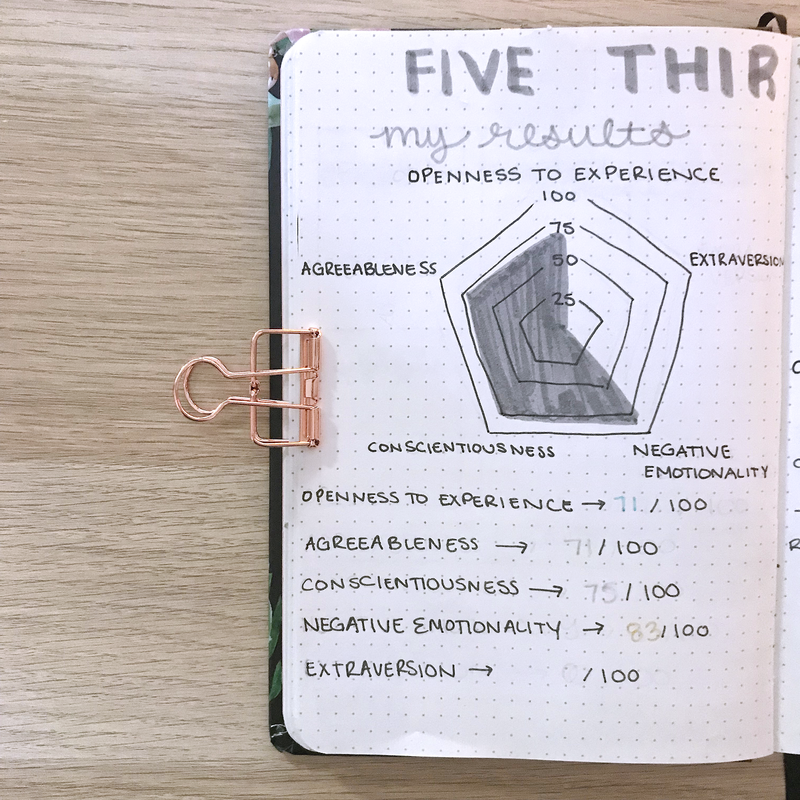 Since I have a degree in Psychology, I always love it when new tests come out – this one was particularly exciting! 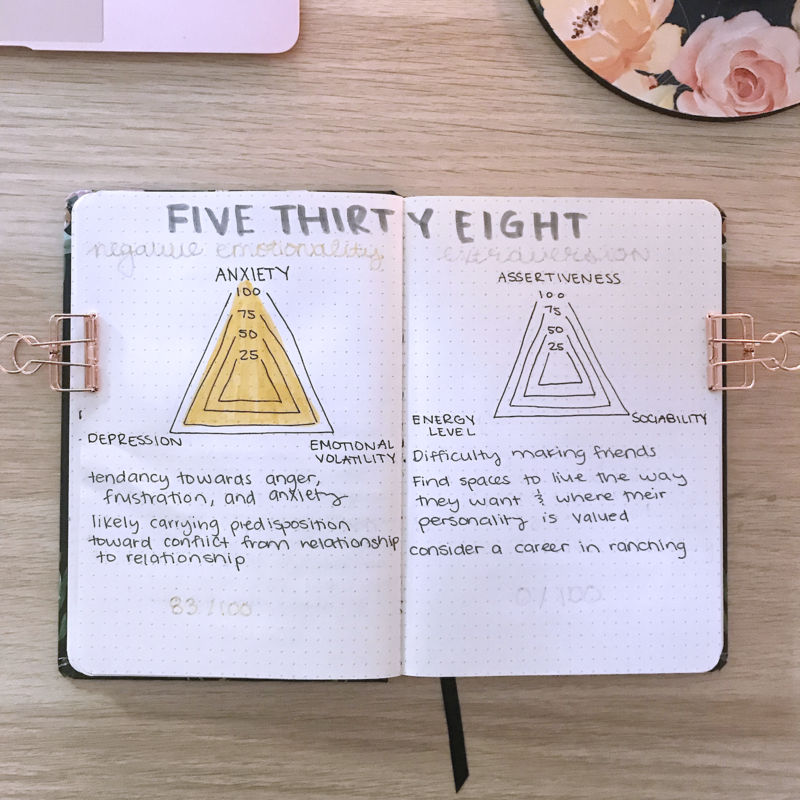 As Maggie Koreth-Baker explains in this article, this test is based on “five broad clusters of traits”, and is science & evidence-based – as opposed to other tests you may find online! The research behind this goes back as far as 1920 (!!). I really recommend reading this article! The test itself is really straightforward, it is 30 questions that you answer on a scale. It took me maybe 5 minutes, so it’s really quick! Once you get your results, you will see they’re based on the 5 groups. 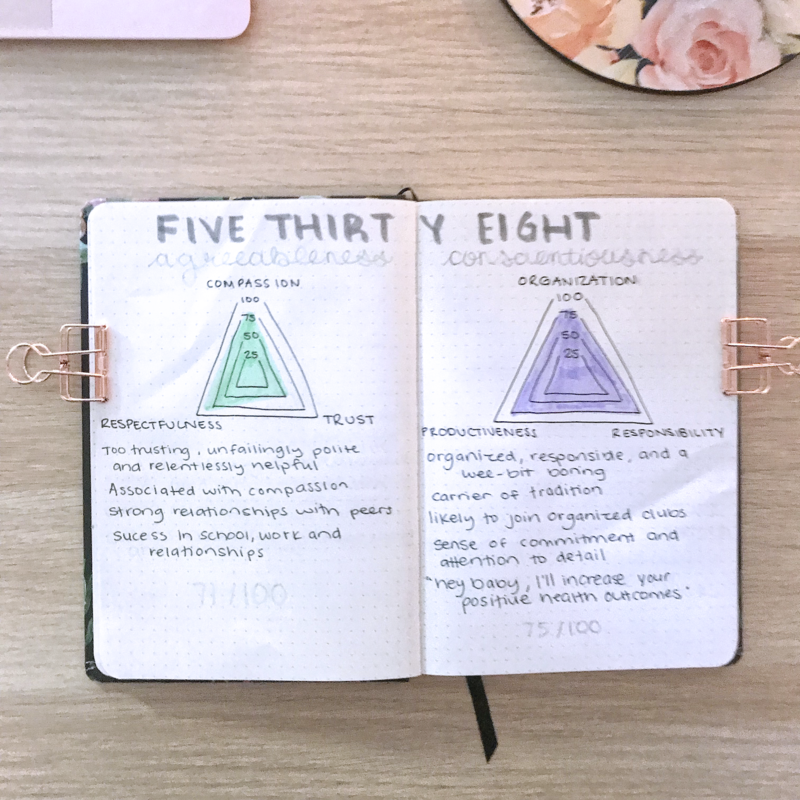 I’m going to walk you through my (at times hilarious) results in my bullet journal! If you take this test I’d love to hear your results in the comments. Supplies used: Peter Pauper Press journal, Tombow Dual Brush Pens, Faber Castell Pitt Artist Pens, Papermate Flairs. The cool thing about this test, is they break these results down for you even further. Let’s dive into mine! As I scored 71/100 in this category that is considered high Openness to Experience. A little blurb is given that explains your results to you, and I was told that I am flexible & open to change. The test also said that I would be good in careers that feed off of that like the arts, science, law, or journalism. It also said that due to this I am at a high risk of substance use disorders. Interesting! The rest of the categories are laid out the same, so I’ll briefly walk you through them now! I scored a 71/100 in this category, so was again considered to have high agreeableness. The description of my results said that I can be too-trusting, polite, and relentlessly helpful. It also claims that I likely have a strong relationship with my peers, and success in school, work and relationships. I scored 75/100 in this category (which is promising as I often blog about productivity!). The results claimed that I am organized, responsible, and a ‘wee-bit boring‘ (lol!). They also said that I am a carrier of tradition, and likely to join organized clubs. Mentioned as well was my sense of commitment and attention to detail. Interestingly, apparently, the partners of those with high conscientiousness are healthier and live longer! I scored 83/100 in this category (not too surprised). 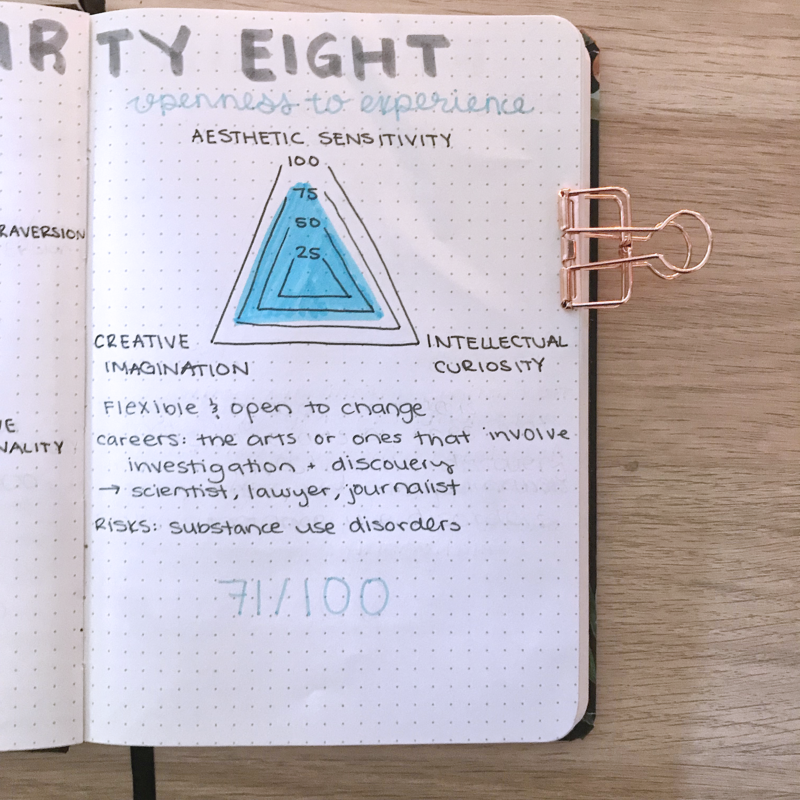 My anxiety scores looked like they almost broke the triangle, haha! According to the results, I have a tendency toward anger, frustration, and anxiety. They also said I am likely carrying this predisposition towards conflict from relationship to relationship. Oh dear!